Some ladies love their cotton tights so much they wear them the whole year round. Because cotton is a natural fibre they can of course keep you warm in winter as they trap your body heat from your legs and keep you toasty, and then they allow your legs to breath in the summer time as their open fibres wicks away moisture, keeping you cool and dry. This product is perfect for both seasons. 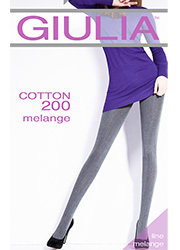 200 denier for superb coverage and given that they are melange (mixed colours) they are truly sophisticated too. Rating: 5 Grey tights make a nice change to black. These are good quality, well fitting tights. I will be buying another pair.